Projections of growth in oil demand led by petrochemicals are by no means a sure thing, Richard Chatterton, BNEF’s Head of Oil Demand, said in a report looking at the future of plastics and oil demand. The world’s growing concern about plastics waste, combined with small but growing competition from bio-based plastics, casts serious doubt on those projections. 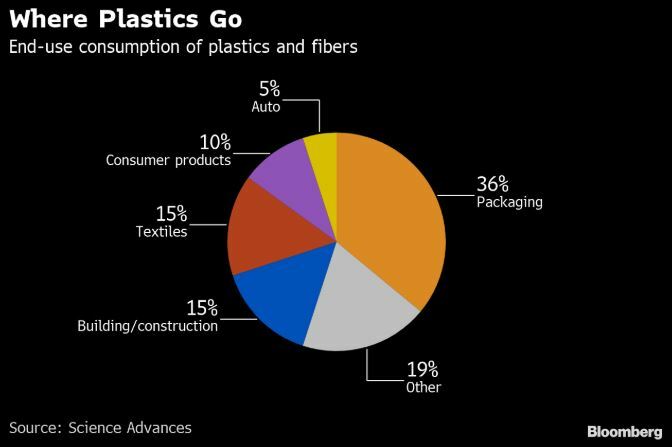 Forecasters including the International Energy Agency and the U.S. Energy Information Administration expect petrochemicals to lead growth in oil demand through 2040 as use of plastics grows in developing economies, particularly in Asia. For the past 15 years, demand for transportation fuel has been the primary driver of growth, but that demand is expected to peak in the 2020s as more electric vehicles hit the roads. More than one in 10 barrels of oil, or about 10 million barrels a day, go into petrochemicals, with primary plastics the biggest end-use product. Global production of basic petrochemicals has risen to more than 500 million metric tons a year from less than 300 million in 2000. China is the largest single producer of petrochemicals. Demand for them will grow at least as fast as global GDP. Use will grow substantially in developing economies as emerging middle classes demand more packaged goods. The development of alternatives will be limited. The automotive and construction sectors are likely to incorporate more plastics as manufacturers try to reduce weight and boost efficiency, but the effort to limit packaging plastics waste threatens all those other assumptions, Chatterton said. The recycling rate, now 18 percent, is growing about 1 point a year thanks to improving economics and government incentives. Regulators and public activists are taking on single-use plastics like bags and straws. Corporations including Coca-Cola, McDonald’s and Starbucks are pledging to reduce their consumption.